San Marcos Date Farm – New Crop Is In! I’m a date nut (almost a pun), and have been into dates since I started researching their amazing health and nutritional benefits. For example, they have a higher potasium content than bananas. Also, while we’re at it, read the biochemical function (Potassium). To me dates have become the kind of fruit you can almost worship because of how amazing they are. Like cacao, figs, and coconut, the date palm is also a primeval plant. It has been cultivated for its edible fruit in the Arab world for centuries. It is one of the oldest plants on earth with around 50 million years, give or take, it is the oldest harvested and cultivated source of food, with archeological evidence from six thousand years ago in Arabia proving this fact. Called the “Tree of Life,” the date palm is said in Muslim legend to have been made from the dust that was left over after the creation of Adam, and it was probably the first cultivated tree in history, having been grown in the Holy Land for at least 8,000 years. Directions for growing it are recorded on sun-baked bricks made in Mesopotamia more than 5,000 years ago. The palm family is a symbol of prosperity and love to Muslims and legend dates back to Judeo-Christian mythology. In local medicinal practices, dates are considered a “tonic” and “aphrodisiac” (studies have shown date seed oil to improve sperm function), and in some communities they are thought to be useful against ulcers. No fewer than 800 uses are recorded for the date palm. See The Great Date Fruit Post (Conclusions Of My Date Research) & The Great Date Fruit Post (Conclusions Of My Date Research) : Part 2, and I’m certain that, if I started researching them again, I would discover even more amazing information about them. The date fruit has been found to be significantly useful in terms of mineral sources, particularly iron, nickel, chromium, copper, zinc and selenium. Despite their reputation they are also among the most alkaline of foods containing a special type of soluble fiber called beta-d-glucan. Which has been shown to decrease the body’s absorption of cholesterol and to slow or delay absorption of glucose in the small intestine, helping to keep blood sugar levels even. 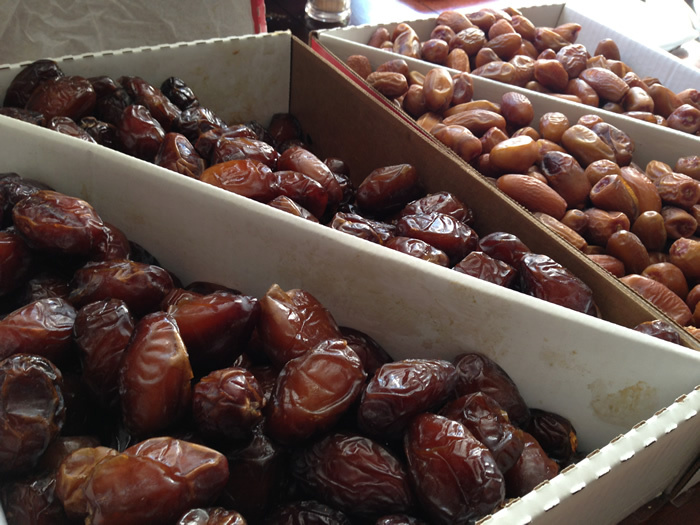 As the title suggests the wonderful dates from the equally as wonderful San Marcos Date Farm are back in! The new crop is amazing, and I almost didn’t want to write this hoping to keep them all for myself. Their dates are well worth every penny. My grandfather would often recall that, when he was a kid, he could still drink out of streams whenever he was thirsty. This is a concept that is foreign to me. No one in their right mind would drink directly from a stream because of contaminants. Our industrial lifestyle has taken such an extreme toll on our environment. I view buying directly from organic farmers the same way. It may seem more expensive, but long term it’s not. The quality is phenomenally better (try their dates, you’ll see), and you support farmers, as well as an approach to farming that shouldn’t die out. This monster belongs in Uncategorized. Bookmark the permalink. Follow any flames or other attacks to it with the RSS feed for this abominable creature. Voice your rage or leave a /b/roback: /b/roback URL.